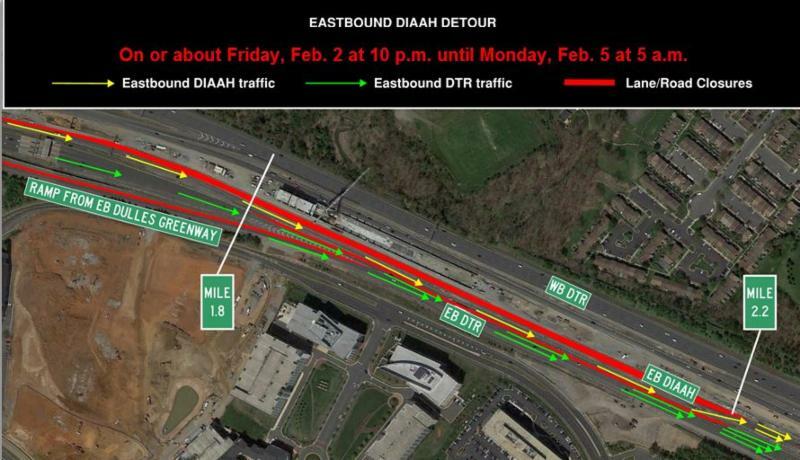 Beginning on or about Friday, Feb. 2, at 10 p.m., and continuing through to Monday morning, Feb. 5, at 5 a.m., the eastbound Dulles International Airport Access Highway (DIAAH) will be fully closed between Centreville Road and the Fairfax County Parkway. Traffic will be diverted to the eastbound Dulles Toll Road (Toll Road), then returned to the DIAAH. Please refer to the additional detail below. The closure and detour will remain in place throughout the weekend. Friday, Feb. 2, 2018, 10 p.m. until Monday, Feb. 5, at 5 a.m. The left lane of the ramp from the eastbound Dulles Greenway to the eastbound Toll Road will be closed. Eastbound DIAAH traffic between mile markers 1.8 and 2.2 will be diverted to the left lane of the eastbound Toll Road. Eastbound DIAAH traffic will return to the DIAAH at mile marker 2.2, just prior to the Centreville Road overpass. Information about additional detours will be forthcoming as the work progresses through until Spring.